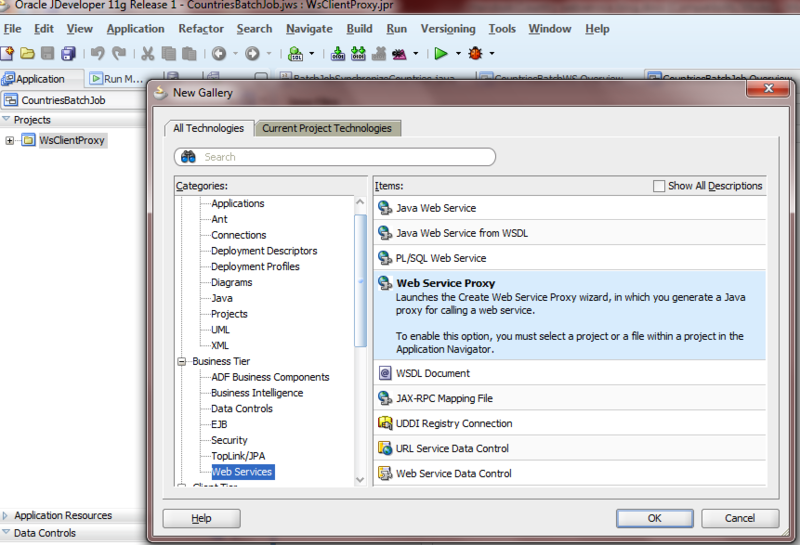 This step-by-step starter hands-on provides an example how to make a JAX-WS webservice proxy in JDeveloper, and save retrieved data from this webservice in a batch-job to your own database with ADF Business Components. For this hands-on example, imagine that your company wants to expand internationally and that reliable, up to date country information is absolutely critical. Recently there were some changes in the number of countries and there might be in the future. Since 1990, 33 new countries have been created. A few months ago the world welcomed a new country (South-Sudan) and yet we dont know what will happen in Libya (maybe it will be separated in West and East-Libya?). Your company wants to weekly synchronise its internal countries database table with up-to-date country information from a recognised country-monitoring institution that delivers up-to-date country information by a webservice. 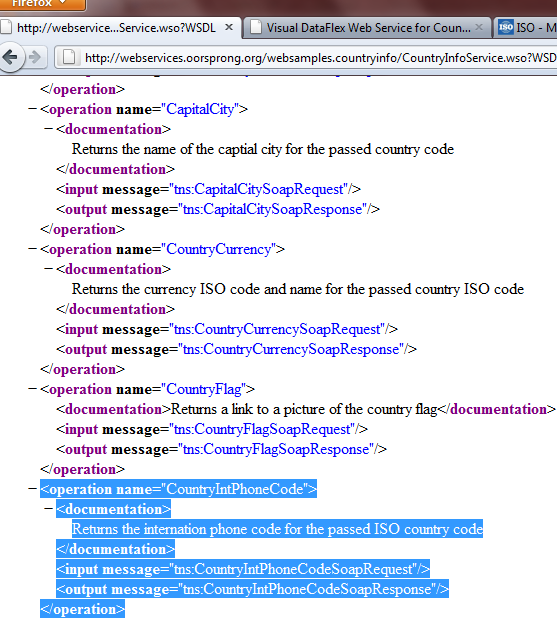 In this example a standard ISO country-code is submitted to the webservice as request parameter for the operation CountryIntPhoneCode. The webservice will give back the international telephone-code back. We are going to use also 3 other operations from this webservice. 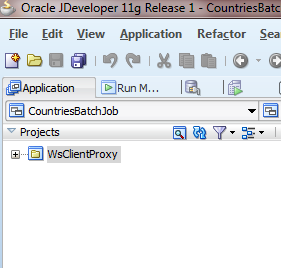 1-Create in JDeveloper a new application and call it for example CountriesBatchJob and the project WsClientproxy. Give appropiate package names. Click next –> next –> finish. 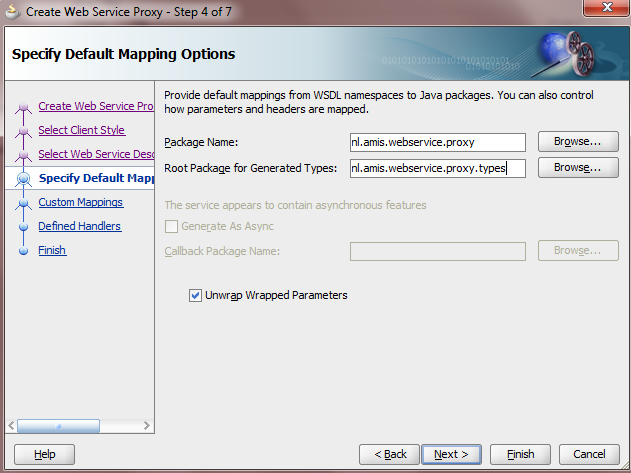 Regenerate the webservice proxy in case you see any red crosses in the generated overview. 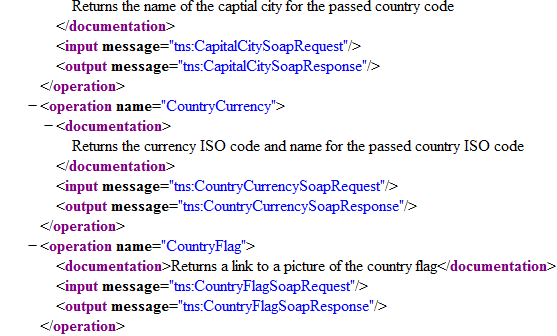 The client class CountryInfoServiceSoapClient will open. Save all. 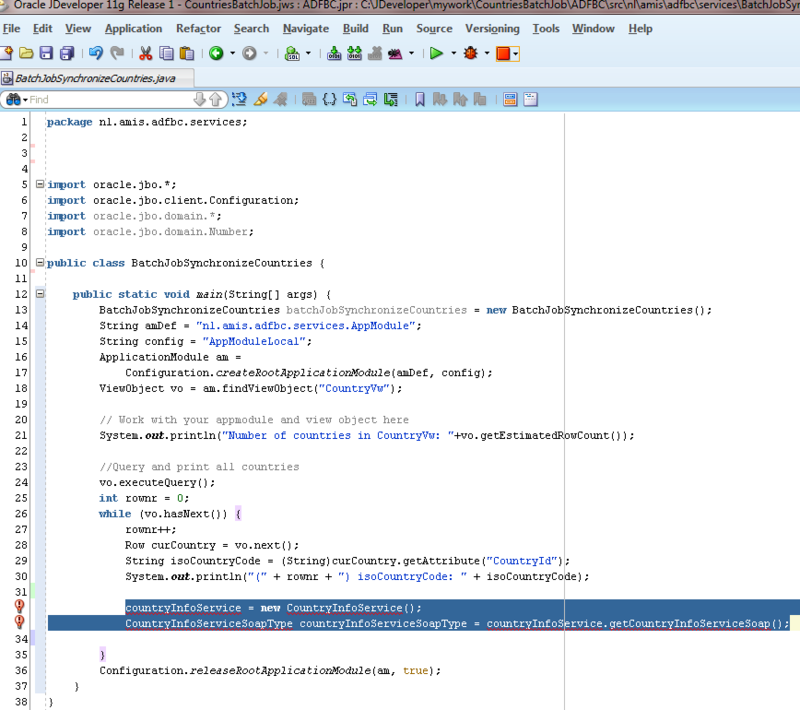 OK, the client is ready en works! 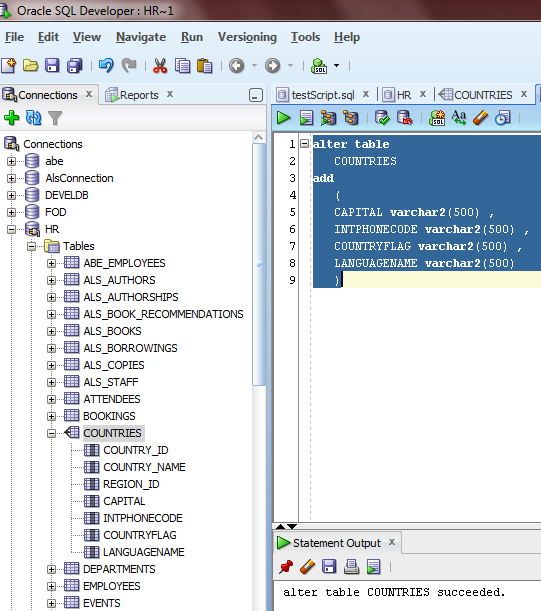 The current database table COUNTRIES from Oracles HR schema is used in this example. Use might need to unlock it first. 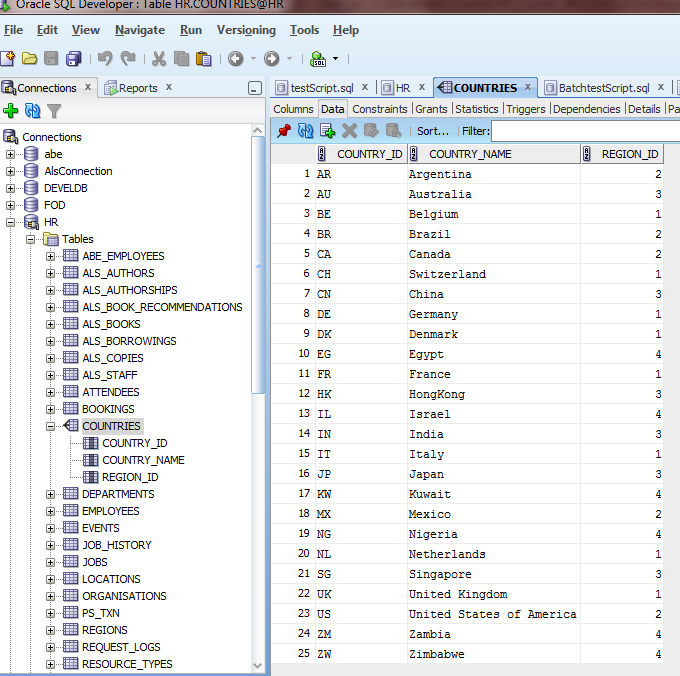 We will synchronise the rows of the COUNTRIES table with up-to-date countries data from the webservice. 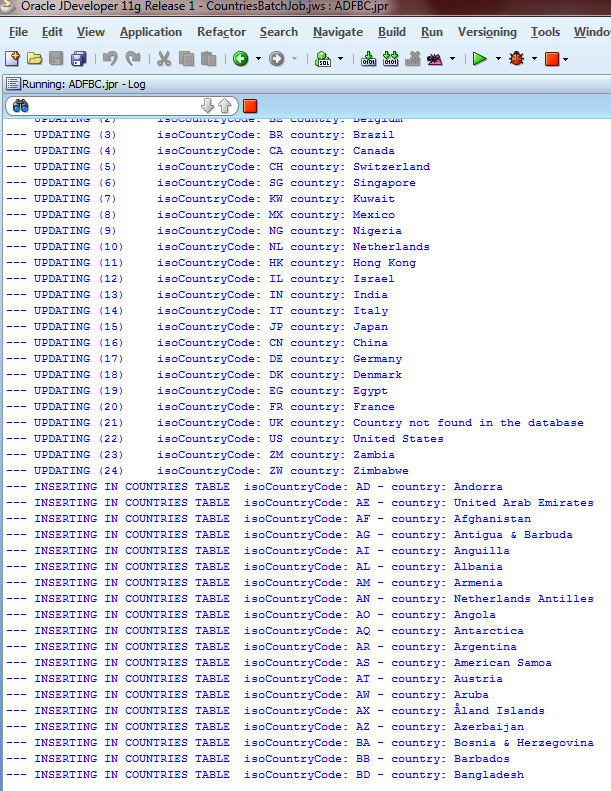 Fortunately the table has already a column COUNTRY_ID that is the PK and is the ISO-landcode. 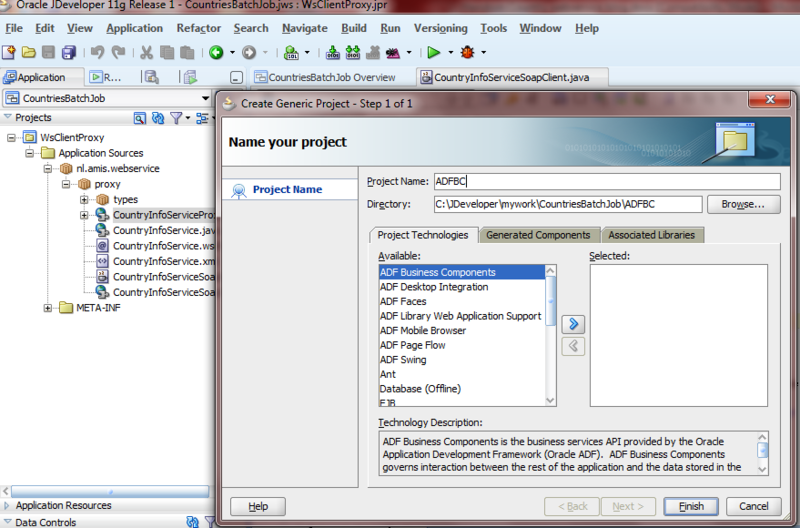 2-Add a new generic project in this application and call it for example ADFBC. 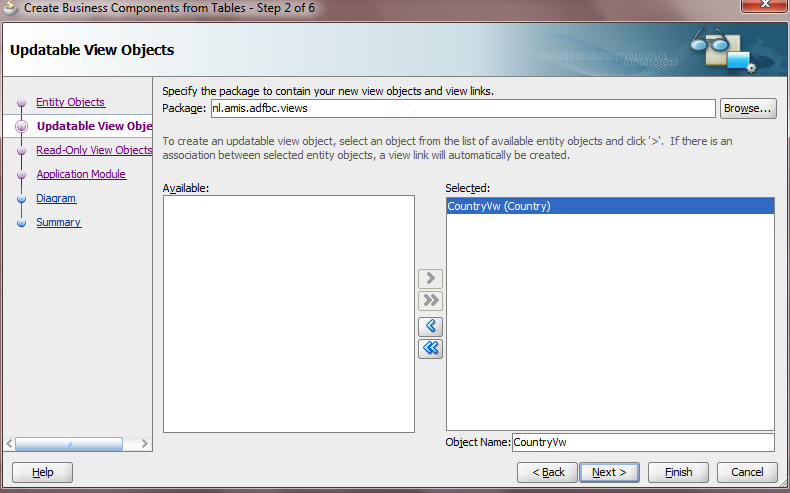 3-Start the wizard ADF Business Components from tables to create the objects for the Country table. 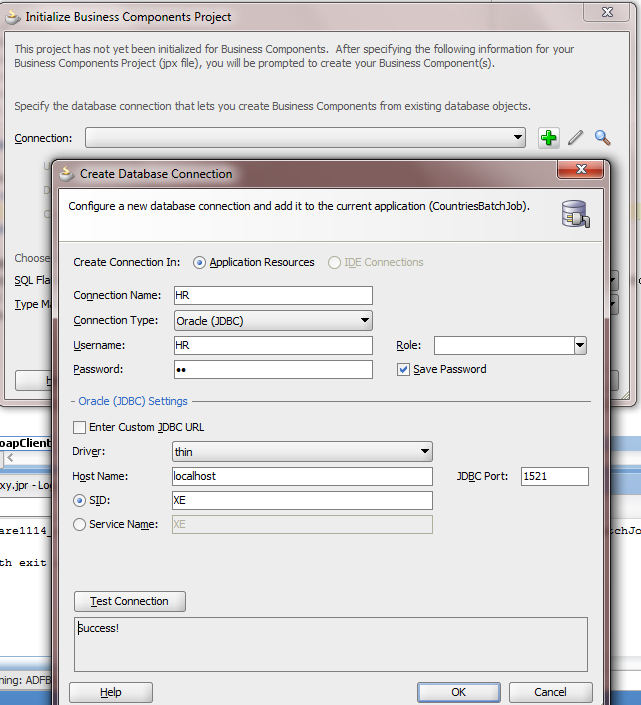 Create a database connection in the wizard with the HR schema. Test it. Walk through the wizard steps. 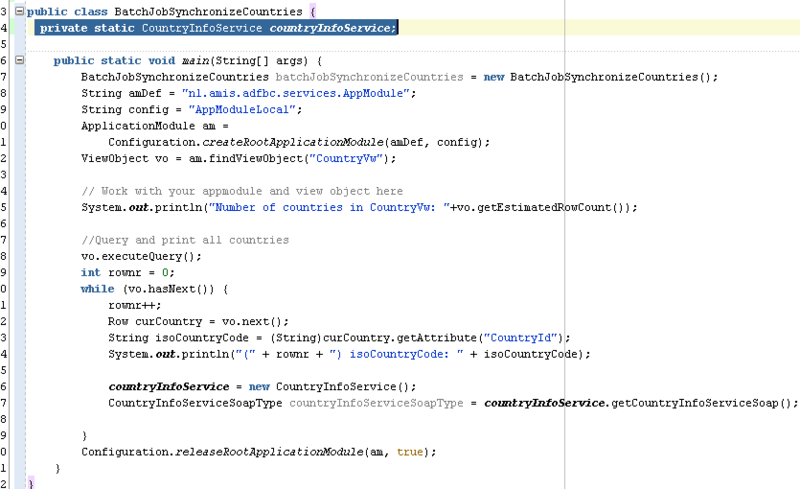 We only need 1 EntityObject (call it: Country), 1 ViewObject (call it: CountryVw) and an ApplicationModule (call it: AppModule). 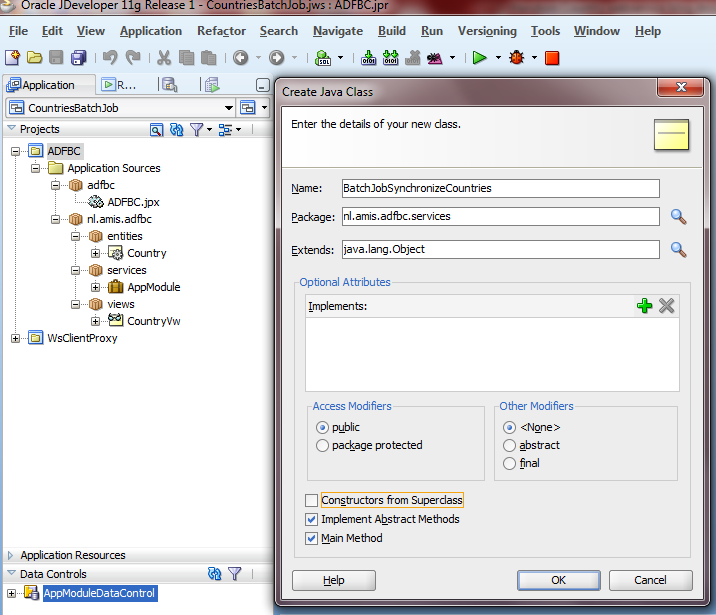 7-Type bc4jclient followed by CTRL + ENTER . Fortunately the call to the countries table succeeded. 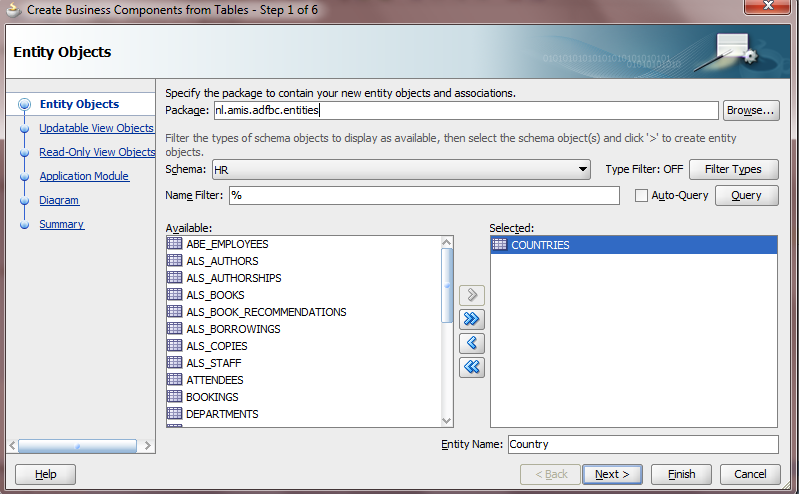 Oracle comes standard with 25 country records in the sample Countries table in the HR schema. 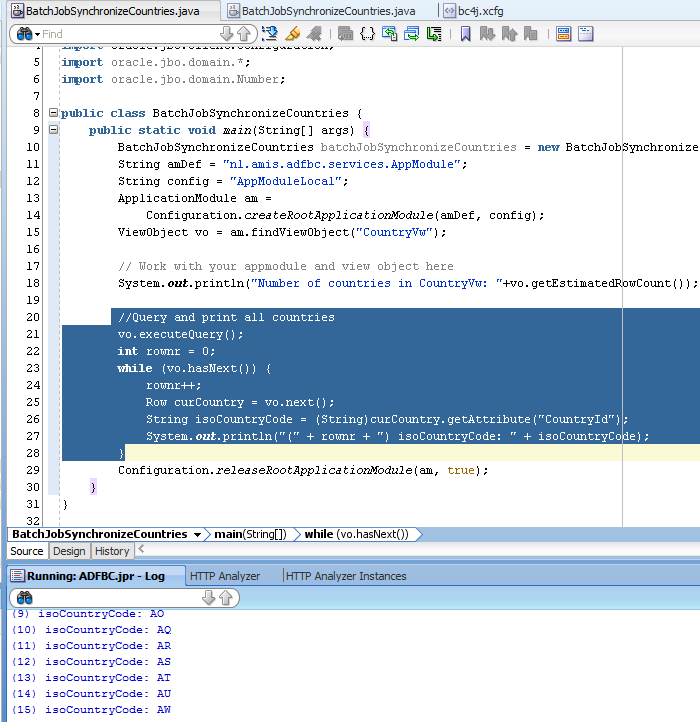 Lets return to the client (proxy) project in JDeveloper. 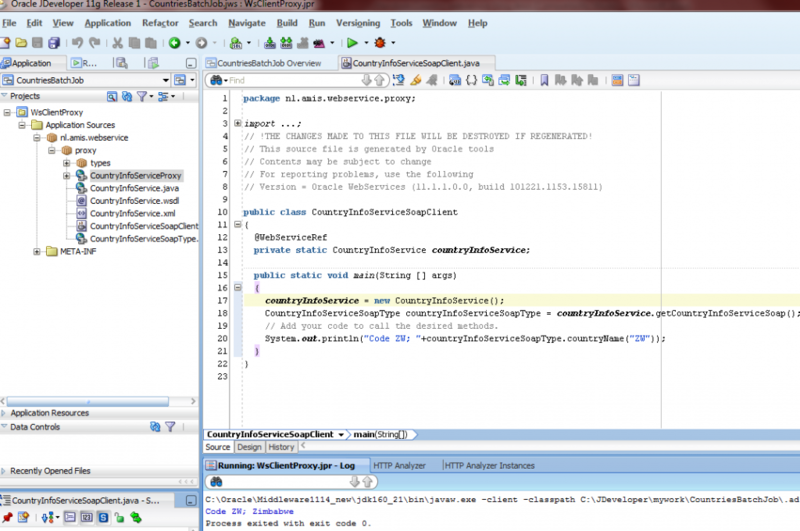 1-We see 2 lines of code that instantiate a proxy object. 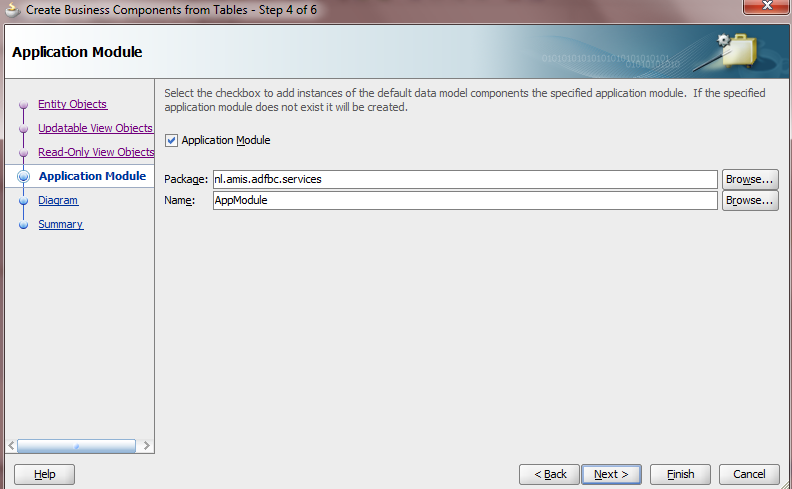 With this object we can later call the operations from the webservice. Copy these lines. 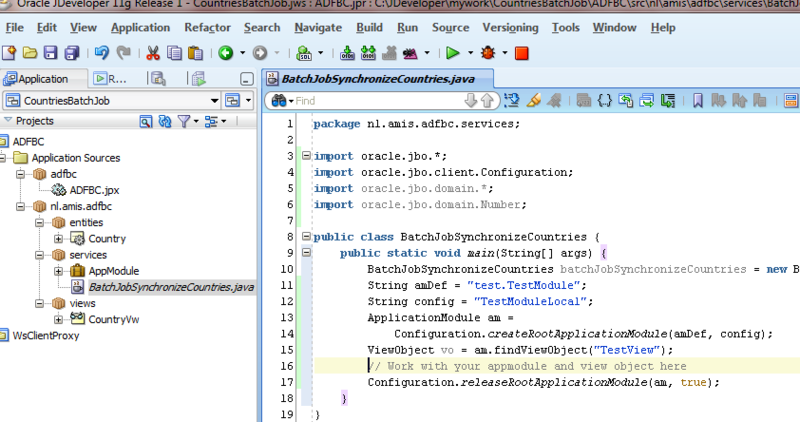 2-Return to our ADFBC project to BatchJobSynchronizeCountries.java. 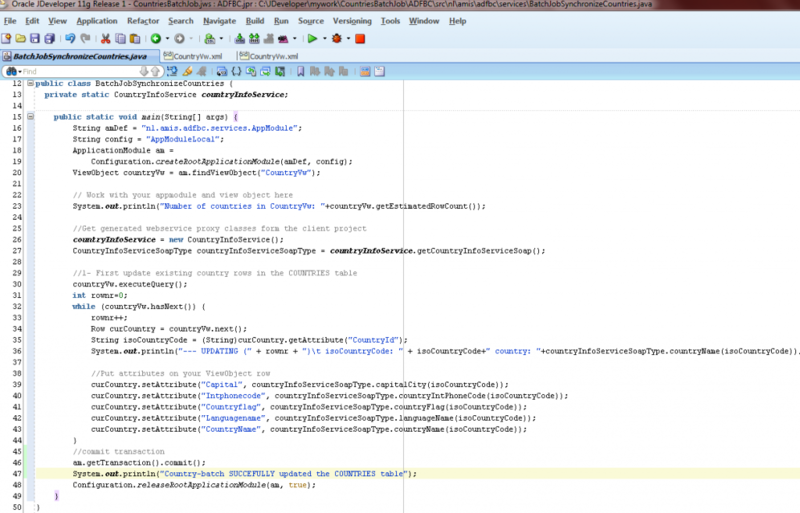 This is because JDeveloper cannot find the previous generated client proxy classes. 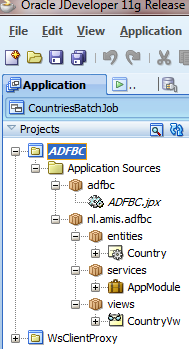 The ADFBC project doesnt know from the existence of our client project. 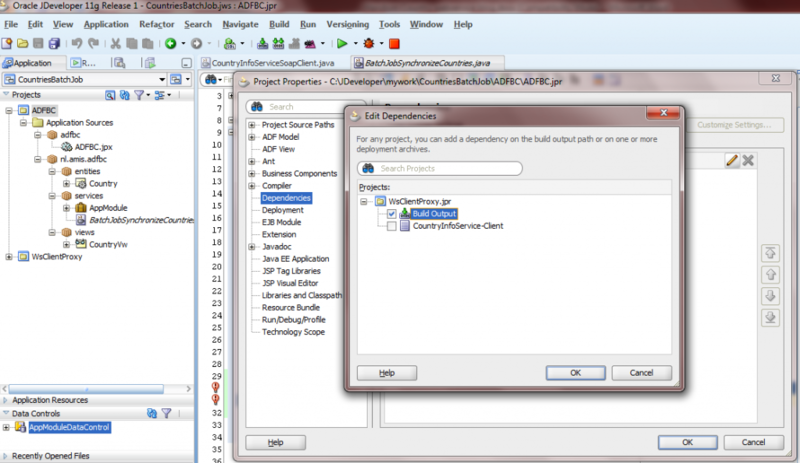 Go to ADFBC project –> right mouse –> properties –> dependencies. Save all. 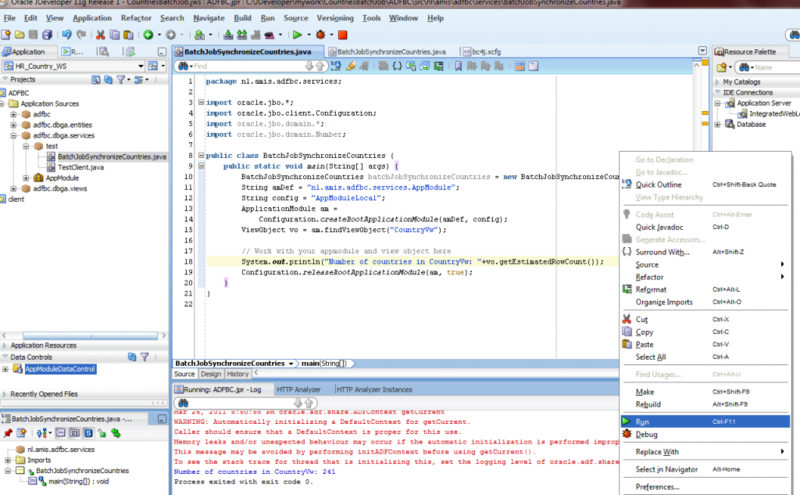 Now JDeveloper is able to find the classes and with ALT+ENTER you have can select the import we need and except for one the red lines disappear. 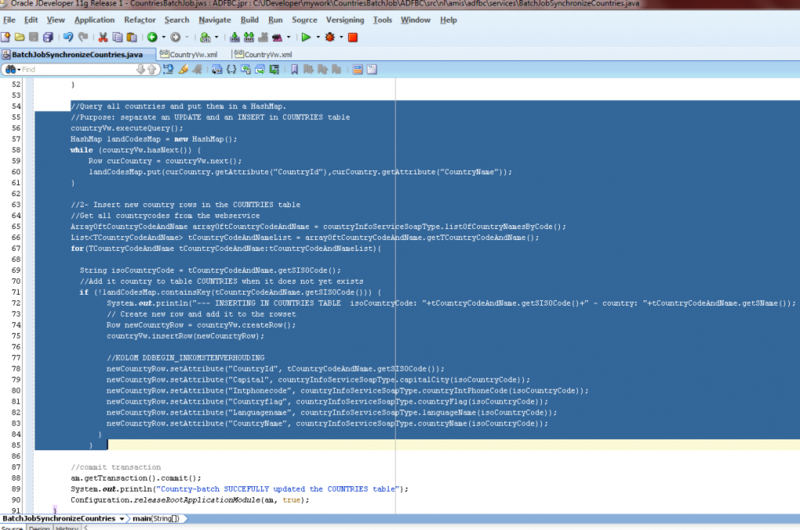 It cannot find the variable countryInfoService. We need to declare it. 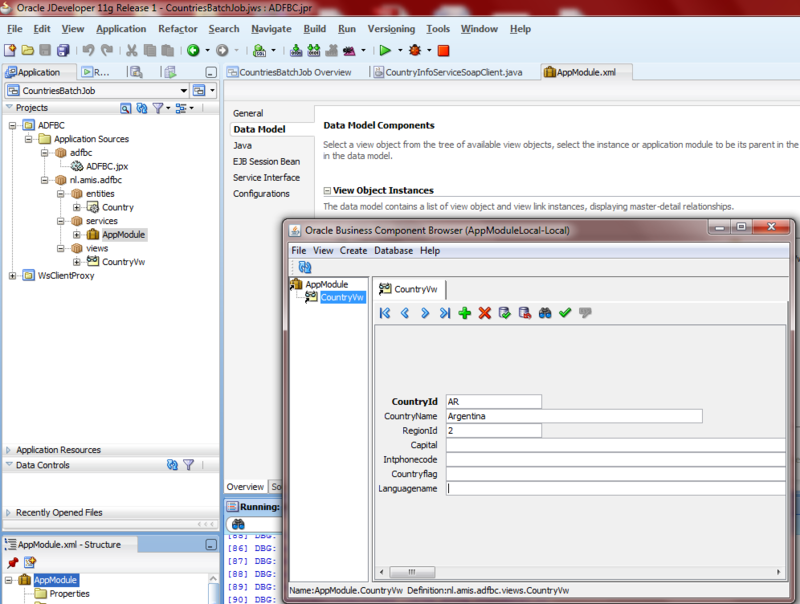 Now the class will compile. 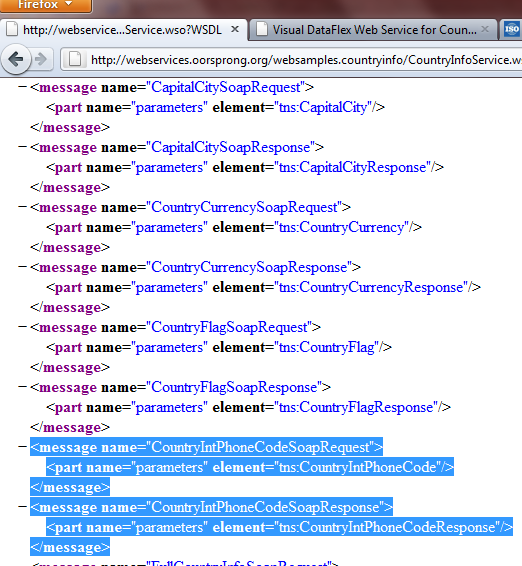 We need to use these names to map the values from the webservice to the Country ViewObject attributes. 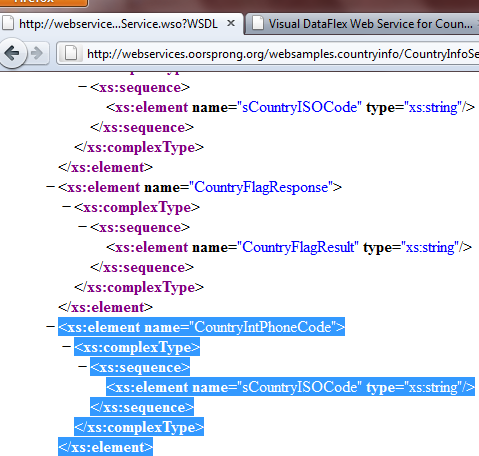 7-This will update all current country records we have in the COUNTRIES table with data from the webservice. Run the class. 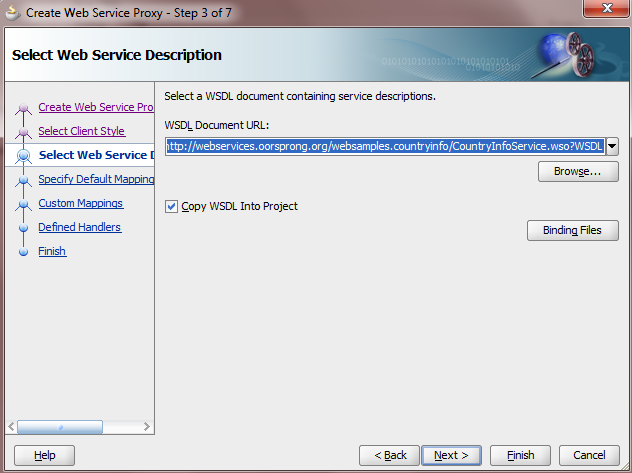 This will update all our country records with the country information from the webservice and commit them. Our update-batch job has been successful! 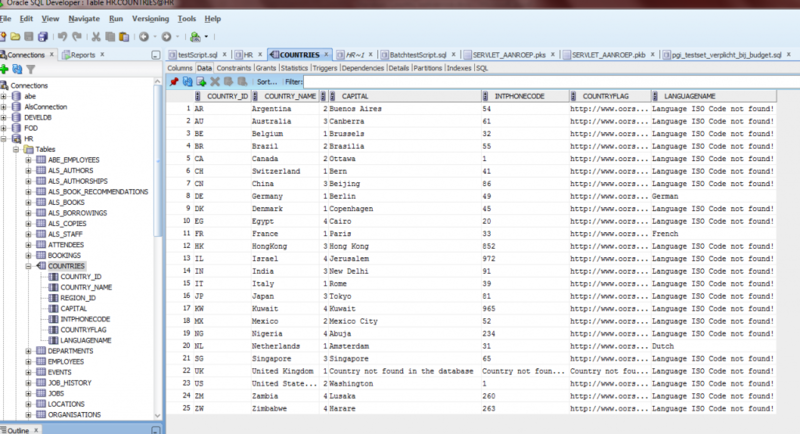 Now, only existing records of the COUNTRIES table are updated. New countries are not yet added and we will do that now. 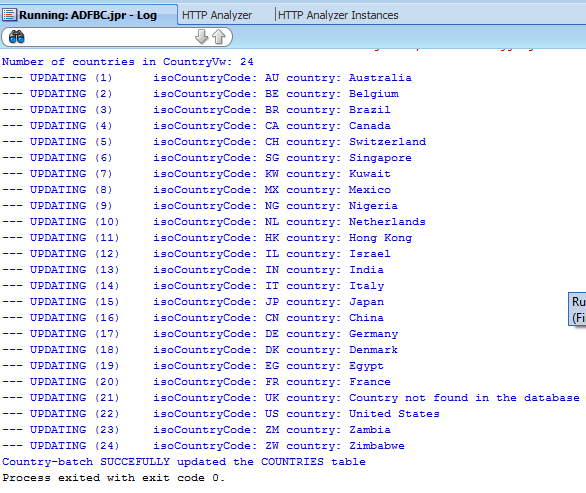 //Query all countries and put them in a HashMap. First, we need to identify countries that do not exist yet in our COUNTRIES table. 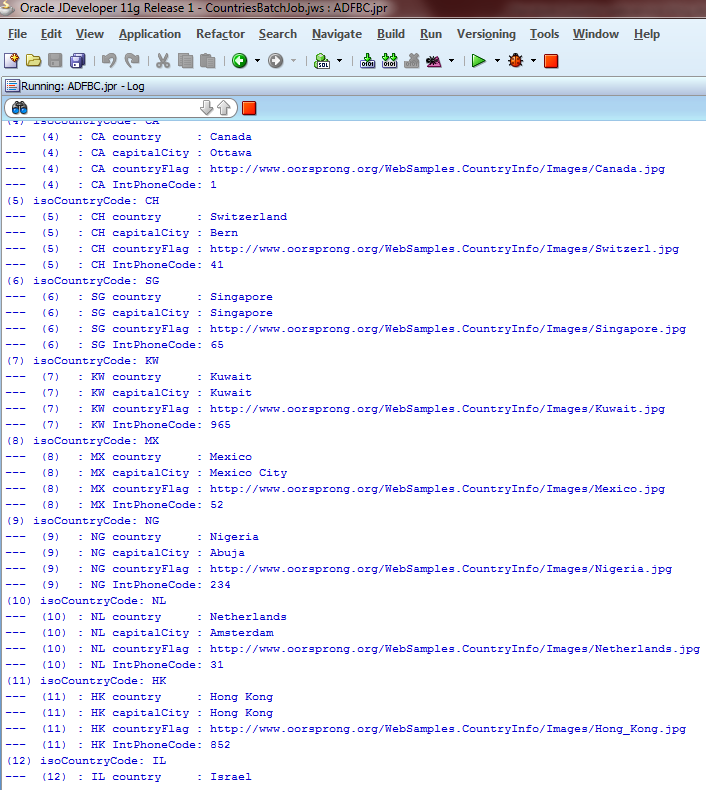 We need a collection (for example a HashMap) with all our current country-records. 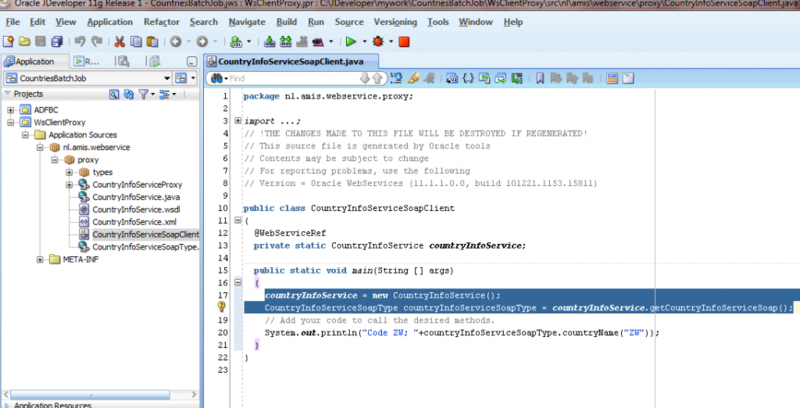 Later, if the webservice returns a countrycode our hashMap doesnt contain, we know that we have to insert that country in our table. 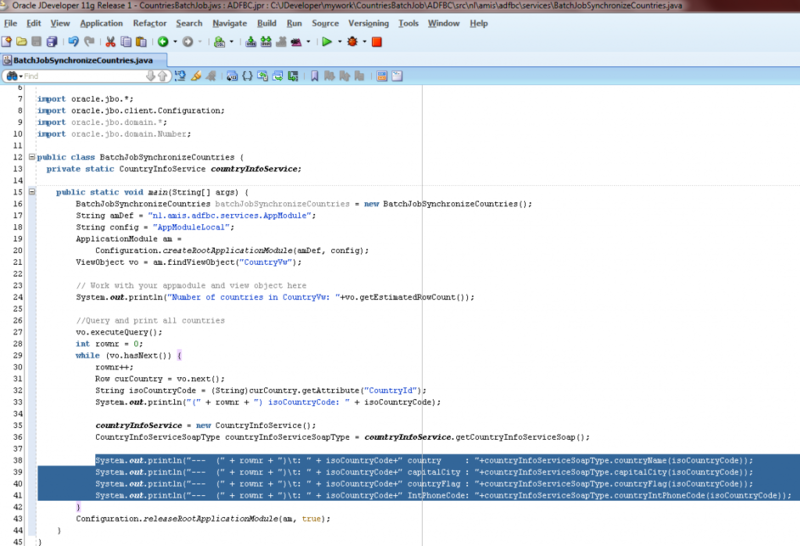 Our synchronize-batch task which took approximately 10 minutes to run – has succeeded!